I let two weeks pass before putting some thoughts on (digital) paper to elaborate on my 3 weeks in Myanmar. Due to the country’s size (it is in fact the fourth biggest country in the world) and the difficulties in transportation, I only had the chance to scratch its surface, spending most of my time in between the pastel tone colonial alleys of Yangon and the North-Eastern hills of the Shan state. This is pretty much the standard path of the tourists who venture to Myanmar and the path the government wants you to follow in order to see only one face of the country: the smiley Buddhist Burmese one. Having read and researched about the country’s history, politics and customs for the past few months I landed in Yangon with a backpack full of pre-conceptions and confused ideas. Yangon is the sprawling capital in which an attentive eye can catch the not so surprising concentration of Muslims and Hindus shops, small businesses and eateries in a small area made up of a few streets in the heart of downtown where these two communities (seemingly) coexist pacifically. Similarly, in Mandalay, the Buddhist centre of the country and starting point of the 969 movement, a Buddhist extremist organization led by the prominent monk U-Wirathu, I was not surprised to hear, whilst chatting with a Burmese English teacher, that ‘yes, there are some good Muslims but mainly, Muslims are illegal Bangladeshi migrants (in reference to the Rohingya community), present in the country in order to marry our women and take over’. However, what struck me the most and represented the most fascinating part of my trip was the Northern area of the Shan state, a region only recently open to tourism and, even more recently, temporarily banned for a resurgence in fights against the plethora of local militias. The sense of Shan identity is clear from the Shan state flags waving on every house, to the numerous T-shirts invoking a Shan independent state, through the regional food varieties and the exclusive use of the Shan language in its numerous variants. Whilst trekking in the countryside north of Hispaw, my local guide taught me how to say ‘Hi’ and ‘thank you’ in three different dialects as, on my two-day hike, I was passing different villages with different variants of Shan language. That he also advised me not to great locals with a cheerful ‘Mingalabar’, the Burmese form for ‘Hi,’ is quite an understatement. Once we reached Pankam, a typical Palaung village, the atmosphere was surreal. The village was the base of the Southern Shan State Army (which was occupying the local school). Whilst foreign tourism is now allowed after a temporary ban, the village is pretty much deserted all day long, with only soldiers (most of them child soldiers) walking around heavily armed. This contradiction is worsened by the fact that the SSSA is fighting a local militia, in a sort of tacit agreement with the villagers: the army is allowed to stay in the village whilst fighting in some defined areas, not targeting the civilian population. The conflict is related to economic reasons more than ideological ones at this stage. Due to the language barrier and the climate of forced coexistence between villagers and soldiers, talking with locals about this situation as well as with army members was challenging even though on the villagers’ side, answers were pretty much the same: a sense of resignation to the army’s presence whilst being positive over the assurance that civilians will not be targeted. 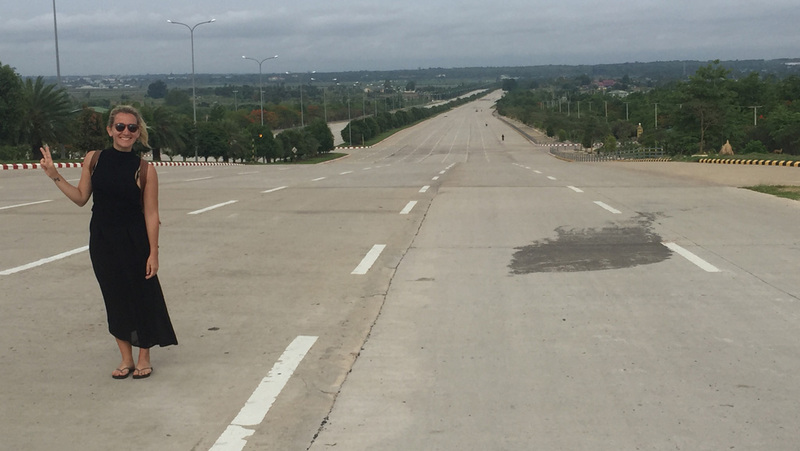 One of the last stops of my trip was the recently built capital of Naypyidaw; in 2006, the capital of Myanmar was moved from Yangon to this ghost town with deserted six-lane highways in the middle of a dusty and hot plain resulting in a capital that is empty and dotted with ‘Communist style’ monuments. Overall, Myanmar confirmed many of my expectations whilst surprising me with other points of view. While I was excepting a general reluctance in people’s willingness to talk or speak out about certain topics, mainly the very contested ones of the inclusion of Muslim communities in the process of democratization or the inability of Aung San Suu Kyi and her NLD government to take a position on the ethnic minorities issue, I was surprised by the extreme fragmentation of the society and the marked sense of identity in minority communities. Most of the people I met did not identify themselves as Myanmar(ese) – if this term will ever come into existence – but rather as Shan, Chin, Kachin, Bamar and so on. This is not surprising if one looks at an Identity card released by the government in which religion and ethnicity are stated in order to formally categorize and classify the entire population. Whilst ethnicity prevails in every single aspect of Myanmar’s society and four decades of isolationism, military rule and ‘demonization’ of ethnic minorities still permeate daily life, it will take more than one generation and a re-organization of the state at an institutional level with further devolution of power and a re-consideration of the education system in order to integrate ethnic minorities and create a sense of national identity. Carlotta Panchetti is studying on the Asian and International Studies MA programme in 2015/16.